Gold. Sun. Life force. These are the words I associate with the middle to end of Summer. I love this time of year when the tall grass forms golden seed heads, giving green fields a shimmer of sunlight. The earth is warm. Markets and gardens are full of fresh produce that has never seen a refrigerator. And when I bite into that slightly warm tomato or fruit, it is as if I am taking the Sun itself into my body. The Sun and life force are one and the same. This week, the festival of Lammas, or First Harvest, celebrates this season of life force. It marks the midpoint of the Summer season and is a good time to honor the vitality freely shared with us through the gifts of the Sun. A mystery held within light-filled Summer is the significance of darkness and the soulful energy of the Moon. Summer begins with Cancer, the Moon’s home sign. The forward momentum of Spring’s emergence slows in the Cancer season, sinks down into the soil, gathers the power of nurturance, and then gives that over to the season of Leo, which is ruled by the Sun. Leo is the sign that represents our gifts and self-worth. I am intrigued by the necessity of first visiting the Moon on our way to reaping our precious first harvests. This reaffirms the importance of home, a dominant theme for this lunar cycle* and for the next year while Jupiter transits Cancer. On the way to harvesting your precious gifts, what attention needs to be paid to your home? What structure allows you to be in touch with your deepest self? Where do you reside? How will you honor your home? May this season of gold, Sun, and life force bless your harvests. Sunday, July 28. Yesterday was a fiery and dynamic day. Strong emotion may have provoked some of us into reaction and action. Today, we exhale and notice what happened. The Moon is still in firey Aries for most of the day, but it is void-of-course and so not as apt to spark intense responses. Venus in Virgo forms a sextile aspect to Jupiter in Cancer. The two benefics of the sky are offering blessings that impact our day-to-day lives—our homes and our work. Although, this is a Sunday and a day of rest for many, we feel industrious and ready to make improvements. Through Venus, Virgo’s desire to bring order and healing create a container for some of the emotional experiences of the last few weeks. Let this momentum create more harmony in your life. July 29—Last Quarter Moon: Evaluating. A beautiful pattern forms in the sky today. The Moon opposes Saturn this morning creating a somewhat rare aspect configuration called a Grand Sextile. A grand sextile is formed when planets are placed in two interlocking triangles (think Star of David). Each triangle is a Grand Trine, which means the planets are in a harmonious aspect to each other in signs with the same element. And by the way, the signs of any grand sextile will either be in the “yin” signs (earth and water) or the “yang” signs (air and fire). The elements of this grand sextile are water and earth. Every grand sextile also has three sets of planetary oppositions, which create the real potential inherent in such patterns. [Another note: astrologers use an evaluation system for deciding how strong an aspect is by how close to exact it is. One of the sextiles in today’s configuration is a little wider than I usually use, but I am allowing it because the energy of the other planets pulls that planet into relationship.] The three oppositions are: Moon in Taurus opposite Saturn in Scorpio; Venus in Virgo opposite Neptune (and Chiron) in Pisces; and Jupiter and Mars in Cancer opposite Pluto in Capricorn. These oppositions indicate core work for us. Coming at this evaluating phase of the Moon, we can apply this work to the intention of this lunar cycle: to find, heal, and reside in the home of our being. What might some of this work be? Some possibilities: acknowledging the delight and wisdom of our bodies, committing to our own healing, honest and deep self-appraisal, noticing how vulnerability helps us connect intimately to others, and balancing empathy with boundaries and discernment. Big issues like these get a boost from the supporting elements of earth and water. Tuesday, July 30. Invite your senses home. Put fresh flowers on the table. Cook something that smells heavenly. Add colors to your décor, textures to your bed, a work of art to your wall, any reminder that you are a sensual being housed in a home of beauty. Venus trines Pluto. Start with your senses and see what passions are awakened. Perhaps passion helps fuel the life force around us as much as the Sun’s light does. Wednesday, July 31. The Moon teaches that all energy is constantly shifting. So, we have to shift too. Yesterday’s grounded delight gives way to mental stimulation. There’s more input from others. Watch out for fantasies as you try to sort out the messages within these interactions. Others are also prone to seeing us through their own fantasies. The big energy today is Mars in Cancer square to Uranus in Aries. Prickly defensiveness could surface. This could be a sign that your deep self needs reassurance. Give yourself love. August 1. We might be pushed and pulled in many directions today. Where do you want to go? The route may not be what you expected. Mars is still square Uranus, so the tension between expressing anger and stifling it is still influential. What is the healthy expression of anger for you? With Venus quincunx Uranus and opposite Chiron, we may be pushed through paradox or frustration to find holistic answers. Sun and Pluto are at odds with each other. Sometimes we focus too much on the light and forget how important the darkness is. Notice that edge between dark and light. August 2—Balsamic Moon: Surrendering. Lammas. Many Pagans celebrate the golden midpoint of Summer today. Join in and give thanks for your first harvests. The contrast between light and dark is strong as the Moon wanes into darkness while the Sun’s strength is celebrated. Most of the day, the Moon is void-of-course in Gemini, so we remain eager to socialize and learn. Gemini seeks connection and integration. The work of this lunar cycle has been to honor the home of body and soul. Has this work yielded a harvest for you? Make this harvest a lasting part of your life. Venus is sextile Mars today. The Cosmic Lovers unite to bless our homes and our harvests. Saturday, August 3. The Moon returns to the sign that began this lunar cycle. We come full circle. The line from T.S. Eliot resonates: “We will not cease from exploration, and the end of all our exploring will be to arrive where we started and know the place for the first time.” The home is such a place—a place of beginning, of leaving, of returning, and of knowing again. Something is entirely new in this return, and something is the same as it always was. Like the tide that flushes the shore with nutrients and then retreats. We come home, and leave, and come home again. The Moon touches every outer planet today. Through a trine to Neptune and Saturn, we dream and transform. Through tense contacts with Jupiter, Pluto and Uranus, the Moon reminds us that whatever happens today feels more significant because it touches upon the deep places inside. What is the tide bringing? One of the first things a child learns to draw is a home. You know the pattern, a simple square topped with a triangle. Usually there is a door in the center and two windows on either side. In the happiest scenes, there is often a tree to the side and the sun in the corner. I like the suns that have smiling faces in them. If you were to draw a home right now, what would it look like? What makes you happy, content, at home? One of my teachers and friends, Donald Engstrom-Reese has written a beautiful piece on his relationship to his home.His words transform the idea of home, basic as a child’s drawing, into the magical and potent place that it can be, and should be, for every person. As I’ve been writing about home since this Cancer lunar cycle* began, I’ve struggled with the discrepancy between the beauty that having a home brings to me and the fact that not everyone has such a home. Not everyone has a physical home that functions as a source of safety and nurturance. That is sad enough. But the real injustice it seems is that not everyone has the sense of an inner home, a place of the deep self where they can find restoration and grounding. That is the home I wish for every soul. The other nagging thought I can’t escape is that as I extol the wonders of home, I must acknowledge the responsibility I have to ensure that home is available for everyone. With this as an intention, the world would be changed forever. These thoughts of the homeless are strong right now for me, I believe, because the water trines (Neptune in Pisces, Saturn in Scorpio, Jupiter and Mars in Cancer) of the past few weeks have been working on me (and all of us) to expand empathic connection with others. This week, a new astrological energy inserts itself into this watery flow. The pragmatic energy of Virgo creates a counterpoint when Venus enters this sign. Water is most effective when it can be contained, given boundaries, and helped to flow through strong channels. We’ll be able to give our empathetic feelings more structure this week. Another brilliant piece of instruction coming from Virgo is the idea of small and steady progress. I’m often dismayed by the magnitude of the problems we face as humans in this world. It doesn’t help to let that feeling overwhelm the truth that even the smallest of actions can make a difference. Our homes teach us this too. Just sweeping the floor can change the energy in the home. How will you sweep through your own overwhelm this week? Sunday, July 21. Energy is building to the Full Moon release tomorrow. That’s what a Full Moon often feels like—the culmination of building energy that must finally flow over the bounds. We can expect the unexpected at the Full Moon. No matter how much mindfulness we practice, there is benefit also to being swept away by the flow. Capricorn Moons aren’t often times of being swept away; but since Capricorn is the sign that is opposite Cancer—the sign of inspiration for this lunar cycle—we may be swept up into the unexpected today. To start things off, at dawn** the Moon contacts Pluto and then Uranus, once again triggering the paradigm-changing square between these two planets. There may be a jagged start to the day. Then the Moon opposes Mercury, which just stationed direct yesterday. This aspect encourages the quality of expecting the unexpected. We want order. We want home. We want to control the changes happening around us. Yet, all of that is not a given for any of us. The goal may be to honor those desires and develop empathy for self and others. This will help us understand a valuable piece of this lunar cycle’s work. 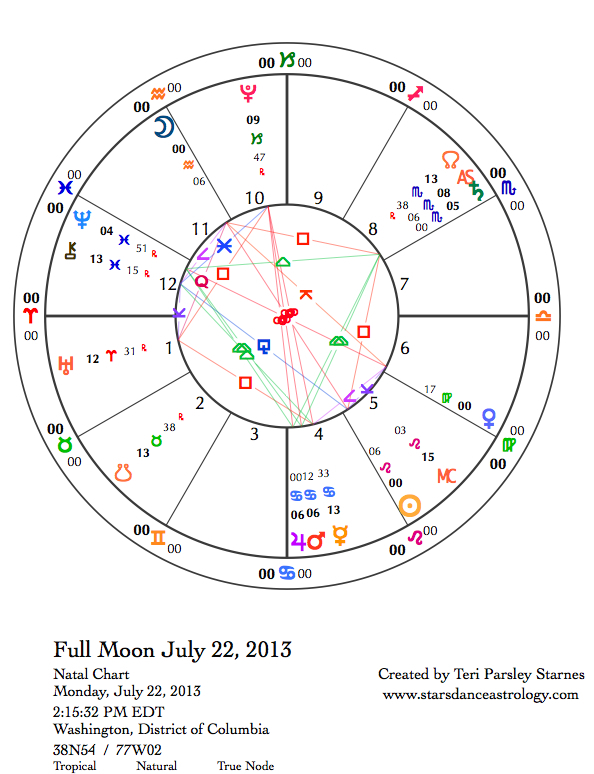 July 22—Full Moon: Illuminating. A new chapter begins today in this lunar cycle intention, which I’ve been framing as the Cancer mission to find, heal, and reside in the home of our being. Heralding this new chapter are Venus entering Virgo; the Sun entering Leo; and the Moon entering Aquarius to immediately oppose the Sun for the Full Moon. I imagine this crest of new energy will activate a desire to take action. If there is healing that is needed, we begin the work of taking care of the situation. If we need more inspiration or life in our homes, we invite in others to add to the vision. There is also a reaction to water and emotion that comes in with this new chapter. We want to get pragmatic and remember that boundaries can actually help us be more effective empathizers. There is an opportunity to achieve balance between commitment and joy. The differences between work and play might blur where it feels good to get things done and too tiring to just sit around and do nothing. 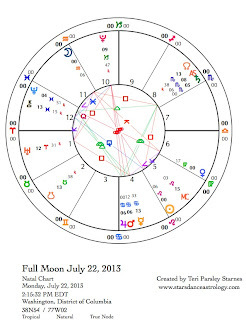 The Full Moon chart is full of interesting aspect configurations. Don’t get me wrong, the energy could be challenging, but given what we’ve experience so far in this cycle, I think many of us will enjoy having the work to do. If you aren’t there yet, know the opportunity will always come back again. That is the wonderful thing about these cycles. Mars and Jupiter come together in an exact conjunction, supercharging the energy of the Grand Water Trine. Hearts open, we feel water taking us to new places of compassion and empathy. We may also remember experiences of wounding and sense more clearly where healing needs to happen. Jupiter, Mars, and a newly-direct Mercury all conspire to ensure we feel the significance that home holds for us. With Pluto opposing these Cancer planets and Uranus squaring them, there is a sense that this is very important. We have an opportunity to see and change old patterns that involve feelings of vulnerability. Approach these feelings with curiosity. The planets in water are supporting new patterns of love. Another aspect configuration involves the Sun, Moon and Saturn in Fixed signs. Since October 2012, Saturn has been encouraging deeper self-knowledge, especially in the areas we usually don’t like to look. If you’ve been doing that work, this Full Moon feels like an opportunity to apply the lessons you’ve been learning to the areas of self-worth and community activism. All our parts are necessary, the parts harboring dark emotions, the parts dreaming of making brilliant contributions, and the parts that push the collective to change and evolve. All of these parts reside in the home of our being. Are you making room for them? Tuesday, July 23. The Moon is void-of course from 9 am till 1:22 pm tomorrow. A void-of-course period feels like a lull in momentum. It may be harder to complete things. This aspect of the Moon can be significant in choosing an election chart (deciding when to begin something astrologically) or a horary chart (using astrology to answer specific questions). As we go through the day, we may appreciate the calm and there is no need to stress over the dip in action. This is a good day to notice the energy of Aquarius—a sign that likes mental activity and abstract concepts. Wednesday, July 24. Did you miss the water? It’s back with the Moon entering Pisces today and activating the Grand Water Trine. However, now we get to use the contribution of Venus in Virgo to create realistic structure around those expansive feelings. Beauty and pleasant social interactions are key to invoking Venus’ help. Simple housework can create more beauty and balance. Friendships that share the same focus of devotion or service feel very rewarding right now. July 25—Disseminating Moon: Sharing. What small action can each of us take to share the gift of home with others? How do ensure that everyone has a safe nurturing place to reside? This phase of the Moon asks us to share the lessons and the benefits that we have incurred so far in the lunar cycle. So share! Let the expansive Pisces Moon lead you to moments of unexpected connection from your home to another. Intuition is a strong guide. Communication and heart-action are supported today. In honor of the watery signs, I plan to bless my home with water from a sacred spring today. Friday, July 26. Before the Moon enters Aries today, Venus in Virgo opposes Neptune in Pisces and we have the opportunity to take our idealism and empathy into the real world. In order to do this, we might have to surrender a fantasy we were clutching tightly. We might have to see the work as menial. We might have to fight a sense of despair. But the rewards are satisfying in a realistic and grounded way. Get active when the Moon shifts to Aries. Saturday, July 27. This is a rather dynamic day. Early, we feel the tension of the t-square aspect configuration of Pluto opposite Jupiter and Mars with all of these planets being square to Uranus. In other words, we might feel triggered, reactive, ansty, impatient. We might encounter opposition from powerful sources. We might feel like we’ve had enough. The emphasis today is on individuality and action. Even though we each are different from each other and can act alone in some situations, it is also important to not feel that we have to act alone to change the world. Even if the connection is only energetic, find someone else who is acting in the world the way you also want to act. Now, there is a link greater than the sum of those parts. The Sun contacts Neptune and Saturn today asking us to see ourselves more realistically so that we can be responsible to high ideals. This is a key lesson for all of us. Home is where we should be safe enough to take off the masks we wear in the world to reveal who we really are. When we are at home, we don’t have to put on an act. We get to be ourselves. The message for this week of the Cancer lunar cycle* is simple: Emotions are more than passing moods. They transmit vital information about who we really are behind our masks and what we really need to be at home. Connected to the water signs, emotions are a continuous flow of memory from the past into the present. They evoke for us the experience and stories that matter most to us. Emotional awareness is key to being at home in ourselves. This week, the starry wanders are calling us to join this flow of emotion. Don’t be surprised if old feelings come up for you this week as the Grand Water Trine between Neptune in Pisces, Saturn in Scorpio, and both Jupiter and Mars in Cancer form a tight connection. Water holds emotional memory of significant experiences. Sometimes the smallest event can bring back those emotions in a flash. This quality of emotion and water helps us survive. It alerts us to situations that might cause us harm, and it also transmits an immediate awareness of what feels right deep in our souls. I invite you to visualize a mandala of the three water signs. For inspiration, consider these images for the three realms of water: the tidal pools of Cancer, where we enjoy the awareness of ebb and flow and the life-giving qualities of water; the deep underground caverns where Scorpio’s penetrating flow surrenders to the dark; and the oceanic waters of Pisces where we lose all distinction between self and other to become One. Water wants to flow this week. Make a stronger connection to this element. Sunday, July 14. Today’s triggering energy stems from the Moon in Libra creating a Grand Cardinal Cross as it contacts Mars, Jupiter, Pluto, and Uranus through challenging aspects during the course of the day and into the early hours of Monday (CDT). Be aware that emotional memories of stress or trauma might arise. The opportunity is to find the calm center where we see the eternal spinning of the cosmic forces of transformation and change spinning around us. This center is a place of power and healing if we can find it. Take care of yourself and be gentle with others. July 15—First Quarter Moon: Manifesting. Yesterday’s big energy resonates today. Balance is a worthy goal when faced with overwhelming emotional experiences. However, rather than trying to contain emotions, see if you can make space for the feelings and the memories. Balance isn’t really a static state of being. It is achieved when we are able to respond in each moment with presence and intention. This phase of the Moon often brings the first true challenge to any New Moon intention. We might feel like giving up or abandoning the vision that began to grow in the dark of the Moon. Home is where we are safe enough to allow all experience to simply be present. This in itself is a big challenge. Honor where you are. Tuesday, July 16. Imagine the dark caverns of underground water signified by the Moon in Scorpio. Are you eager to journey beneath the surface of emotion into the deeper memories that are encoded there? Or are you terrified of what you may discover? Actually, both responses are understandable. We feel a pull go deep and a resistance too. This is a Grand Water Trine day. Emotions may trigger memories of losing and seeking control. Be alert to the emotions that hold memories of empowerment and vitality. These will guide you to deeper places too. Wednesday, July 17. Yesterday’s watery reverie was training for today, where both water and volatility collide. For one, Uranus in Aries is stationing retrograde today. This planet of abrupt change and explosive desire for authenticity is strong. And, although there is no aspect to Mercury retrograding through Cancer right now, if we are the least bit thrown off by unexpected snafus in communication or transportation systems, this station by Uranus will increase the tendency for short tempers and impulsive reactions. In addition, Jupiter, who likes to make things bigger, is moving into exact trines with Neptune and Saturn—yes, the Grand Water Trine again, which just got more intense. Be careful when driving, take extra time in communicating, and practice patience with yourself. That’s the best way I know to be patient with others. Thursday, July 18. Mutable signs often are criticized for not being serious enough. But that just may be the reason we are happy the Moon is in a mutable sign today. Sometimes we need a break from intensity, deep feelings, and coping with frustrations. Today is that day! Have fun. It wouldn’t even be a mistake to take in some form escapist entertainment tonight. A science fiction or fantasy movie sounds about right. July 19—Gibbous Moon: Perfecting. What are you noticing about your home? Have you been able to perceive the qualities you need in your place of soul, security, and connection with your beloveds? Has emotional memory given you important information about the state of your home? Acknowledge whatever you have or have not experienced so far in this lunar cycle. When water is the primary teacher, ideas and philosophy are much less relevant. Note the quality of your heart. Without expectation or judgment, let this feeling be enough. Today, Saturn trines Neptune for the third, and final time, in this series of aspects between these two planets. The first trine was in October 2012 and the second happened recently in June 2013 . These two outer planets carry big weight. They are the reason the Grand Water Trine I’ve been writing about is so significant. A trine is an opportunity that can be missed. The benefit is not automatic. However, if we consciously engage with the potential, there is an enormous opportunity to make deeper connections between our souls and spirits. I admit that I don’t fully understand the difference between my soul and my spirit. But if these two planets are the guides, then I would say they are teaching that the soul is related to depth and personal experience and the spirit is related to compassion and universal connection. An alignment between these realms is profound. Saturday, July 20. Hang on, Mercury stations direct today. There’s a blip in the flow. Maybe you won’t even notice it as Mars in Cancer moves into the Grand Water Trine directing our wills to focus, once again, on emotional experience. The Moon in grounded, no-nonsense Capricorn presents an interesting counterpoint. If you’ve been left feeling a little waterlogged, relief is on the way. Capricorn cares about the structure that contains the flow. Without boundaries and a good container, all the emotional awareness in the world won’t help us understand what we need to do about our lives. For that, look to the Mountain Goat of Capricorn. Capricorn helps Cancer to integrate the emotional experience of home to help create a home that lasts.